“The richest 20% own 80% of our wealth.” Stencil from the recently-formed Éirígí (web) on Suffolk Road. Éirígí (web) was formed in 2006 and became a political party in 2007, with candidates standing for two seats in 2011’s local elections. 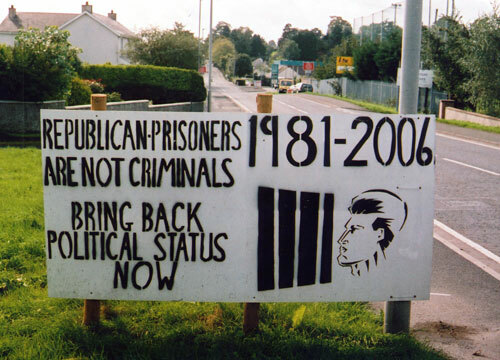 For its public art, it used stencils in promoting itself and issues such as the continued presence of British troops in the North (“There are more British troops in Ireland than in Iraq”). Andersonstown Road, Belfast. “Join now – http://www.rsym.org&#8221; The Republican Socialist Youth Movement is no longer at the URL. Beechmount Avenue, Belfast, next to the Turkish Hunger Strikes and Santa Is A British Agent. UVF stencil, perhaps dating back to the mid-1990s, in Pearl Street, Belfast. This vintage mural was in Kilcoo, Co Down. It seems that an Easter lily was paint-bombed and graffitied over with “IRA” and “saoirse” stencils. Anarchist graffiti in Market Street, Derry, with a “Kill your television” stencil. The bulldozer in question is the D9, an armoured vehicle used by the IDF Combat Engineering Force (WP) for house demolition (WP).